When is a cough not a common cold? Home > When is a cough not a common cold? Tommy, age 9 months, came to my office several times for episodes of coughing and wheezing. One November afternoon, he was brought in again for the same complaint, didn’t respond well, and appeared to deteriorate. A plain chest film showed a possible narrowing of the right mainstem bronchus; this was looked at further with an MRI of the chest. The correct diagnosis was then made: Tommy had a cardiovascular abnormality — a bifid aorta with a vascular ring — along with right bronchial stenosis. Cough is a common presenting complaint in the doctor’s office. It can heralda multitude of different conditions, so how do you distinguish them onthe basis of the physical exam? Because cough receptors also reside in the pharynx, paranasal sinuses and external auditory canal, it’s oftennecessary to look beyond the lungs for the source of a persistent cough. A good history is essential. Has the child failed to thrive? Does she have a fever? Are there any infectious contacts? Inquire exactly when the cough symptoms occur. A cough that’s been present for a long period will point you in the direction of a chronic condition, such as asthma — one of the commonest causes of chronic cough in children. Nocturnal cough may suggest sinusitis whereas coughing during the day is more often linked to viral upper respiratory infections (URIs). These constitute the most frequent etiology for a child’s acute cough. Associated features are also a good indicator. For instance, did the episode begin during eating or choking? You may have to hunt for a foreign body. Are the symptoms worsened by activity? In other words, could it be asthma? Ask about wheezing. Although it’s typical of asthma, young children may experience this symptom with viral infections such as respiratory syncytial virus or bronchiolitis. Once their small airways enlarge, the wheezing resolves. Never fail to consider other causes of first-time wheezing — it could be due to a foreign body, anatomic abnormalities or even cardiac failure. A cough that hurts suggests pleuritis or pericarditis. Painful breathing, or grunting respiration along with tachypnea and fever, raises suspicions of bacterial pneumonia. Frightening for parents to listen to, viral croup presents with stridor in a young child and hoarseness in an older one. Look out for it in the winter months. Finally, it’s always useful whenever possible to have the child cough for you. The quality of the cough is often very instructive. 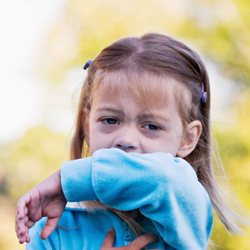 A paroxysmal cough that can’t be easily controlled suggests pertussis. A “juicy” or mucousy one is usually the result of a viral URI. A dry cough that never quite seems to clear might be the result of asthma or viral pneumonia. Richard Haber, MD, FAAP, FRCPC is an associate professor of pediatrics at McGill University and the Director of the Pediatric Consultation Centre at the Montreal Children’s Hospital. He is also a community pediatrician.